"UFO" redirects here. For other uses, see UFO (disambiguation). "ufo" redirects here. For the genus ufo of gall-wasps, see Ufo abei. During the late 1940s and through the 1950s, UFOs were often referred to popularly as "flying saucers" or "flying discs". The term UFO became more widespread during the 1950s, at first in technical literature, but later in popular use. UFOs garnered considerable interest during the Cold War, an era associated with a heightened concern for national security. Various studies have concluded that the phenomenon does not represent a threat to national security nor does it contain anything worthy of scientific pursuit (e.g., 1951 Flying Saucer Working Party, 1953 CIA Robertson Panel, USAF Project Blue Book, Condon Committee). The acronym "UFO" was coined by Captain Edward J. Ruppelt, who headed Project Blue Book, then the USAF's official investigation of UFOs. He wrote, "Obviously the term 'flying saucer' is misleading when applied to objects of every conceivable shape and performance. For this reason the military prefers the more general, if less colorful, name: unidentified flying objects. UFO (pronounced Yoo-foe) for short." Other phrases that were used officially and that predate the UFO acronym include "flying flapjack", "flying disc", "unexplained flying discs", "unidentifiable object", and "flying saucer". The phrase "flying saucer" had gained widespread attention after the summer of 1947. On June 24, a civilian pilot named Kenneth Arnold reported seeing nine objects flying in formation near Mount Rainier. Arnold timed the sighting and estimated the speed of discs to be over 1,200 mph (1,931 km/h). At the time, he described the objects' shape as being somewhat disc-like or saucer-like, leading to newspaper accounts of "flying saucers" and "flying discs". In popular usage, the term UFO came to be used to refer to claims of alien spacecraft. and because of the public and media ridicule associated with the topic, some investigators prefer to use such terms as unidentified aerial phenomenon (or UAP) or anomalous phenomena, as in the title of the National Aviation Reporting Center on Anomalous Phenomena (NARCAP). Studies have established that the majority of UFO observations are misidentified conventional objects or natural phenomena—most commonly aircraft, balloons, noctilucent clouds, nacreous clouds, or astronomical objects such as meteors or bright planets with a small percentage even being hoaxes. [note 1] Between 5% and 20% of reported sightings are not explained, and therefore can be classified as unidentified in the strictest sense. While proponents of the extraterrestrial hypothesis (ETH) suggest that these unexplained reports are of alien spacecraft, the null hypothesis cannot be excluded that these reports are simply other more prosaic phenomena that cannot be identified due to lack of complete information or due to the necessary subjectivity of the reports. While UFOs have been the subject of extensive investigation by various governments and although a few scientists have supported the extraterrestrial hypothesis, almost no scientific papers about UFOs have been published in peer-reviewed journals. There was, in the past, some debate in the scientific community about whether any scientific investigation into UFO sightings is warranted with the general conclusion being that the phenomenon was not worthy of serious investigation beyond a cultural artifact. The void left by the lack of institutional scientific study has given rise to independent researchers and groups, including the National Investigations Committee on Aerial Phenomena (NICAP) in the mid-20th century and, more recently, the Mutual UFO Network (MUFON) and the Center for UFO Studies (CUFOS). The term "Ufology" is used to describe the collective efforts of those who study reports and associated evidence of unidentified flying objects. UFOs have become a prevalent theme in modern culture, and the social phenomena have been the subject of academic research in sociology and psychology. Unexplained aerial observations have been reported throughout history. Some were undoubtedly astronomical in nature: comets, bright meteors, one or more of the five planets that can be seen with the naked eye, planetary conjunctions, or atmospheric optical phenomena such as parhelia and lenticular clouds. An example is Halley's Comet, which was recorded first by Chinese astronomers in 240 BC and possibly as early as 467 BC. Such sightings throughout history often were treated as supernatural portents, angels, or other religious omens. Some current-day UFO researchers have noticed similarities between some religious symbols in medieval paintings and UFO reports though the canonical and symbolic character of such images is documented by art historians placing more conventional religious interpretations on such images. On January 25, 1878, the Denison Daily News printed an article in which John Martin, a local farmer, had reported seeing a large, dark, circular object resembling a balloon flying "at wonderful speed." Martin, according to the newspaper account, said it appeared to be about the size of a saucer, the first known use of the word "saucer" in association with a UFO. In April 1897, thousands of people reported seeing "airships" in various parts of the United States. Many signed affidavits. Scores of people even reported talking to the pilots. Thomas Edison was asked his opinion, and said, "You can take it from me that it is a pure fake." On February 28, 1904, there was a sighting by three crew members on the USS Supply 300 miles (483 km) west of San Francisco, reported by Lieutenant Frank Schofield, later to become Commander-in-Chief of the Pacific Battle Fleet. Schofield wrote of three bright red egg-shaped and circular objects flying in echelon formation that approached beneath the cloud layer, then changed course and "soared" above the clouds, departing directly away from the earth after two to three minutes. The largest had an apparent size of about six Suns, he said. The three earliest known pilot UFO sightings, of 1,305 similar sitings cataloged by NARCAP, took place in 1916 and 1926. On January 31, 1916, a UK pilot near Rochford reported a row of lights, resembling lighted windows on a railway carriage, that rose and disappeared. In January 1926 a pilot reported six "flying manhole covers" between Wichita, Kansas, and Colorado Springs, Colorado. In late September 1926 an airmail pilot over Nevada said he had been forced to land by a huge, wingless, cylindrical object. On August 5, 1926, while traveling in the Humboldt Mountains of Tibet's Kokonor region, Russian explorer Nicholas Roerich reported, members of his expedition saw "something big and shiny reflecting the sun, like a huge oval moving at great speed. Crossing our camp the thing changed in its direction from south to southwest. And we saw how it disappeared in the intense blue sky. We even had time to take our field glasses and saw quite distinctly an oval form with shiny surface, one side of which was brilliant from the sun." Another description by Roerich was of a "shiny body flying from north to south. Field glasses are at hand. It is a huge body. One side glows in the sun. It is oval in shape. Then it somehow turns in another direction and disappears in the southwest." In the Pacific and European theatres during World War II, "foo fighters" (metallic spheres, balls of light and other shapes that followed aircraft) were reported and on occasion photographed by Allied and Axis pilots. Some proposed Allied explanations at the time included St. Elmo's fire, the planet Venus, hallucinations from oxygen deprivation, or German secret weapons. In 1946, more than 2,000 reports were collected, primarily by the Swedish military, of unidentified aerial objects over the Scandinavian nations, along with isolated reports from France, Portugal, Italy and Greece. The objects were referred to as "Russian hail" and later as "ghost rockets" because it was thought that the mysterious objects were possibly Russian tests of captured German V1 or V2 rockets. Although most were thought to be such natural phenomena as meteors, more than 200 were tracked on radar by the Swedish military and deemed to be "real physical objects." In a 1948 top secret document, Swedish authorities advised the USAF Europe that some of their investigators believed these craft to be extraterrestrial in origin. UFOs have been subject to investigations over the years that varied widely in scope and scientific rigor. Governments or independent academics in the United States, Canada, the United Kingdom, Japan, Peru, France, Belgium, Sweden, Brazil, Chile, Uruguay, Mexico, Spain, and the Soviet Union are known to have investigated UFO reports at various times. Among the best known government studies are the ghost rockets investigation by the Swedish military (1946–1947), Project Blue Book, previously Project Sign and Project Grudge, conducted by the USAF from 1947 until 1969, the secret U.S. Army/Air Force Project Twinkle investigation into green fireballs (1948–1951), the secret USAF Project Blue Book Special Report No. 14 by the Battelle Memorial Institute, and the Brazilian Air Force's 1977 Operação Prato (Operation Saucer). France has had an ongoing investigation (GEPAN/SEPRA/GEIPAN) within its space agency Centre national d'études spatiales (CNES) since 1977; the government of Uruguay has had a similar investigation since 1989. Project Sign in 1948 produced a highly classified finding (see Estimate of the Situation) that the best UFO reports probably had an extraterrestrial explanation. A top secret Swedish military opinion given to the USAF in 1948 stated that some of their analysts believed that the 1946 ghost rockets and later flying saucers had extraterrestrial origins. (For document, see Ghost rockets.) In 1954 German rocket scientist Hermann Oberth revealed that an internal West German government investigation, which he headed, had arrived at an extraterrestrial conclusion, but this study was never made public. Project Sign was dismantled and became Project Grudge at the end of 1948. Angered by the low quality of investigations by Grudge, the Air Force Director of Intelligence reorganized it as Project Blue Book in late 1951, placing Ruppelt in charge. Blue Book closed down in 1970, using the Condon Committee's negative conclusion as a rationale, thus ending official Air Force UFO investigations. However, a 1969 USAF document, known as the Bolender memo, along with later government documents, revealed that non-public U.S. government UFO investigations continued after 1970. The Bolender memo first stated that "reports of unidentified flying objects that could affect national security ... are not part of the Blue Book system," indicating that more serious UFO incidents already were handled outside the public Blue Book investigation. The memo then added, "reports of UFOs which could affect national security would continue to be handled through the standard Air Force procedures designed for this purpose. "[note 2] In addition, in the late 1960s a chapter on UFOs in the Space Sciences course at the U.S. Air Force Academy gave serious consideration to possible extraterrestrial origins. When word of the curriculum became public, the Air Force in 1970 issued a statement to the effect that the book was outdated and that cadets instead were being informed of the Condon Report's negative conclusion. Air Force Regulation 200-2, issued in 1953 and 1954, defined an Unidentified Flying Object ("UFOB") as "any airborne object which by performance, aerodynamic characteristics, or unusual features, does not conform to any presently known aircraft or missile type, or which cannot be positively identified as a familiar object." The regulation also said UFOBs were to be investigated as a "possible threat to the security of the United States" and "to determine technical aspects involved." The regulation went on to say that "it is permissible to inform news media representatives on UFOB's when the object is positively identified as a familiar object," but added: "For those objects which are not explainable, only the fact that ATIC [Air Technical Intelligence Center] will analyze the data is worthy of release, due to many unknowns involved." J. Allen Hynek, a trained astronomer who served as a scientific advisor for Project Blue Book, was initially skeptical of UFO reports, but eventually came to the conclusion that many of them could not be satisfactorily explained and was highly critical of what he described as "the cavalier disregard by Project Blue Book of the principles of scientific investigation." Leaving government work, he founded the privately funded CUFOS, to whose work he devoted the rest of his life. Other private groups studying the phenomenon include the MUFON, a grass roots organization whose investigator's handbooks go into great detail on the documentation of alleged UFO sightings. Like Hynek, Jacques Vallée, a scientist and prominent UFO researcher, has pointed to what he believes is the scientific deficiency of most UFO research, including government studies. He complains of the mythology and cultism often associated with the phenomenon, but alleges that several hundred professional scientists—a group both he and Hynek have termed "the invisible college"—continue to study UFOs in private. The study of UFOs has received little support in mainstream scientific literature. Official studies ended in the U.S. in December 1969, following the statement by the government scientist Edward Condon that further study of UFOs could not be justified on grounds of scientific advancement. The Condon Report and its conclusions were endorsed by the National Academy of Scientists, of which Condon was a member. On the other hand, a scientific review by the UFO subcommittee of the American Institute of Aeronautics and Astronautics (AIAA) disagreed with Condon's conclusion, noting that at least 30 percent of the cases studied remained unexplained and that scientific benefit might be gained by continued study. Critics argue that all UFO evidence is anecdotal and can be explained as prosaic natural phenomena. Defenders of UFO research counter that knowledge of observational data, other than what is reported in the popular media, is limited in the scientific community and that further study is needed. No official government investigation has ever publicly concluded that UFOs are indisputably real, physical objects, extraterrestrial in origin, or of concern to national defense. These same negative conclusions also have been found in studies that were highly classified for many years, such as the UK's Flying Saucer Working Party, Project Condign, the U.S. CIA-sponsored Robertson Panel, the U.S. military investigation into the green fireballs from 1948 to 1951, and the Battelle Memorial Institute study for the USAF from 1952 to 1955 (Project Blue Book Special Report No. 14). Some public government reports have acknowledged the possibility of physical reality of UFOs, but have stopped short of proposing extraterrestrial origins, though not dismissing the possibility entirely. Examples are the Belgian military investigation into large triangles over their airspace in 1989–1991 and the 2009 Uruguayan Air Force study conclusion (see below). Some private studies have been neutral in their conclusions, but argued that the inexplicable core cases call for continued scientific study. Examples are the Sturrock panel study of 1998 and the 1970 AIAA review of the Condon Report. The Interplanetary Phenomenon Unit (IPU), established by the U.S. Army sometime in the 1940s, and about which little is known. In 1987, British UFO researcher Timothy Good received from the Army's director of counter-intelligence a letter confirming the existence of the IPU. The letter stated that "the aforementioned Army unit was disestablished during the late 1950s and never reactivated. All records pertaining to this unit were surrendered to the U.S. Air Force Office of Special Investigations in conjunction with operation BLUEBOOK." The IPU records have never been released. The investigation of UFOs has also attracted many civilians, who in the U.S formed research groups such as NICAP (active 1956–1980), Aerial Phenomena Research Organization (APRO) (active 1952–1988), MUFON (active 1969–), and CUFOS (active 1973–). In November 2011, the White House released an official response to two petitions asking the U.S. government to acknowledge formally that aliens have visited this planet and to disclose any intentional withholding of government interactions with extraterrestrial beings. According to the response, "The U.S. government has no evidence that any life exists outside our planet, or that an extraterrestrial presence has contacted or engaged any member of the human race." Also, according to the response, there is "no credible information to suggest that any evidence is being hidden from the public's eye." The response further noted that efforts, like SETI and NASA's Kepler space telescope and Mars Science Laboratory, continue looking for signs of life. The response noted "odds are pretty high" that there may be life on other planets but "the odds of us making contact with any of them—especially any intelligent ones—are extremely small, given the distances involved." Following the large U.S. surge in sightings in June and early July 1947, on July 9, 1947, United States Army Air Forces (USAAF) intelligence, in cooperation with the FBI, began a formal investigation into selected sightings with characteristics that could not be immediately rationalized, which included Kenneth Arnold's and that of the United Airlines crew. The USAAF used "all of its top scientists" to determine whether "such a phenomenon could, in fact, occur." The research was "being conducted with the thought that the flying objects might be a celestial phenomenon," or that "they might be a foreign body mechanically devised and controlled." Three weeks later in a preliminary defense estimate, the air force investigation decided that, "This 'flying saucer' situation is not all imaginary or seeing too much in some natural phenomenon. Something is really flying around." This led to the creation of the Air Force's Project Sign at the end of 1947, one of the earliest government studies to come to a secret extraterrestrial conclusion. In August 1948, Sign investigators wrote a top-secret intelligence estimate to that effect, but the Air Force Chief of Staff Hoyt Vandenberg ordered it destroyed. The existence of this suppressed report was revealed by several insiders who had read it, such as astronomer and USAF consultant J. Allen Hynek and Capt. Edward J. Ruppelt, the first head of the USAF's Project Blue Book. the reports of incidents convince us that there is something going on that must have immediate attention ... Sightings of unexplained objects at great altitudes and traveling at high speeds in the vicinity of major U.S. defense installations are of such a nature that they are not attributable to natural phenomena or any known types of aerial vehicles. The matter was considered so urgent that OS/I drafted a memorandum from the DCI to the NSC proposing that the NSC establish an investigation of UFOs as a priority project throughout the intelligence and the defense research and development community. It also urged the DCI to establish an external research project of top-level scientists, now known as the Robertson Panel to analyze the problem of UFOs. The OS/I investigation was called off after the Robertson Panel's negative conclusions in January 1953. Controversy has surrounded the Condon Report, both before and after it was released. It has been observed that the report was "harshly criticized by numerous scientists, particularly at the powerful AIAA ... [which] recommended moderate, but continuous scientific work on UFOs." In an address to the AAAS, James E. McDonald stated that he believed science had failed to mount adequate studies of the problem and criticized the Condon Report and earlier studies by the USAF as scientifically deficient. He also questioned the basis for Condon's conclusions and argued that the reports of UFOs have been "laughed out of scientific court." J. Allen Hynek, an astronomer who worked as a USAF consultant from 1948, sharply criticized the Condon Committee Report and later wrote two nontechnical books that set forth the case for continuing to investigate UFO reports. Ruppelt recounted his experiences with Project Blue Book, a USAF investigation that preceded Condon's. The Roswell UFO incident (1947) involved New Mexico residents, local law enforcement officers, and the U.S. military, the latter of whom allegedly collected physical evidence from the UFO crash site. The Betty and Barney Hill abduction (1961) was the first reported abduction incident. In the Kecksburg UFO incident, Pennsylvania (1965), residents reported seeing a bell shaped object crash in the area. Police officers, and possibly military personnel, were sent to investigate. The Travis Walton abduction case (1975): The movie Fire in the Sky (1993) was based on this event, but embellished greatly the original account. In Canada, the Department of National Defence has dealt with reports, sightings and investigations of UFOs across Canada. In addition to conducting investigations into crop circles in Duhamel, Alberta, it still considers "unsolved" the Falcon Lake incident in Manitoba and the Shag Harbour UFO incident in Nova Scotia. Early Canadian studies included Project Magnet (1950–1954) and Project Second Storey (1952–1954), supported by the Defence Research Board. On March 2007, the French space agency CNES published an archive of UFO sightings and other phenomena online. French studies include GEPAN/SEPRA/GEIPAN (1977–), within CNES (French space agency), the longest ongoing government-sponsored investigation. About 22% of 6000 cases studied remain unexplained. The official opinion of GEPAN/SEPRA/GEIPAN has been neutral, stating on their FAQ page that their mission is fact-finding for the scientific community, not rendering an opinion. They add they can neither prove nor disprove the Exterrestrial Hypothesis (ETH), but their Steering Committee's clear position is that they cannot discard the possibility that some fraction of the very strange 22% of unexplained cases might be due to distant and advanced civilizations. Possibly their bias may be indicated by their use of the terms "PAN" (French) or "UAP" (English equivalent) for "Unidentified Aerospace Phenomenon" (whereas "UAP" as normally used by English organizations stands for "Unidentified Aerial Phenomenon", a more neutral term). In addition, the three heads of the studies have gone on record in stating that UFOs were real physical flying machines beyond our knowledge or that the best explanation for the most inexplicable cases was an extraterrestrial one. In 2008, Michel Scheller, president of the Association Aéronautique et Astronautique de France (3AF), created the Sigma Commission. Its purpose was to investigate UFO phenomenon worldwide. A progress report published in May 2010 stated that the central hypothesis proposed by the COMETA report is perfectly credible. In December 2012, the final report of the Sigma Commission was submitted to Scheller. Following the submission of the final report, the Sigma2 Commission is to be formed with a mandate to continue the scientific investigation of UFO phenomenon. The most notable cases of UFO sightings in France include the Valensole UFO incident in 1965, and the Trans-en-Provence Case in 1981. The UK's Flying Saucer Working Party published its final report in June 1951, which remained secret for over 50 years. The Working Party concluded that all UFO sightings could be explained as misidentifications of ordinary objects or phenomena, optical illusions, psychological misperceptions/aberrations, or hoaxes. The report stated: "We accordingly recommend very strongly that no further investigation of reported mysterious aerial phenomena be undertaken, unless and until some material evidence becomes available." Eight file collections on UFO sightings, dating from 1978 to 1987, were first released on May 14, 2008, to The National Archives by the Ministry of Defence (MoD). Although kept secret from the public for many years, most of the files have low levels of classification and none are classified Top Secret. 200 files are set to be made public by 2012. The files are correspondence from the public sent to the British government and officials, such as the MoD and Margaret Thatcher. The MoD released the files under the Freedom of Information Act due to requests from researchers. These files include, but are not limited to, UFOs over Liverpool and the Waterloo Bridge in London. On October 20, 2008, more UFO files were released. One case released detailed that in 1991 an Alitalia passenger aircraft was approaching London Heathrow Airport when the pilots saw what they described as a "cruise missile" fly extremely close to the cockpit. The pilots believed that a collision was imminent. UFO expert David Clarke says that this is one of the most convincing cases for a UFO he has come across. A secret study of UFOs was undertaken for the Ministry of Defence between 1996 and 2000 and was code-named Project Condign. The resulting report, titled "Unidentified Aerial Phenomena in the UK Defence Region", was publicly released in 2006, but the identity and credentials of whomever constituted Project Condign remains classified. The report confirmed earlier findings that the main causes of UFO sightings are misidentification of man-made and natural objects. The report noted: "No artefacts of unknown or unexplained origin have been reported or handed to the UK authorities, despite thousands of Unidentified Aerial Phenomena reports. There are no SIGINT, ELINT or radiation measurements and little useful video or still IMINT." It concluded: "There is no evidence that any UAP, seen in the UKADR [UK Air Defence Region], are incursions by air-objects of any intelligent (extraterrestrial or foreign) origin, or that they represent any hostile intent." A little-discussed conclusion of the report was that novel meteorological plasma phenomenon akin to ball lightning are responsible for "the majority, if not all" of otherwise inexplicable sightings, especially reports of black triangle UFOs. in over fifty years, no UFO report has revealed any evidence of a potential threat to the United Kingdom. The MoD has no specific capability for identifying the nature of such sightings. There is no Defence benefit in such investigation and it would be an inappropriate use of defence resources. Furthermore, responding to reported UFO sightings diverts MoD resources from tasks that are relevant to Defence." The Guardian reported that the MoD claimed the closure would save the Ministry around £50,000 a year. The MoD said that it would continue to release UFO files to the public through The National Archives. According to records released on August 5, 2010, British wartime prime minister Winston Churchill banned the reporting for 50 years of an alleged UFO incident because of fears it could create mass panic. Reports given to Churchill asserted that the incident involved a Royal Air Force (RAF) reconnaissance aircraft returning from a mission in France or Germany toward the end of World War II. It was over or near the English coastline when it was allegedly intercepted by a strange metallic object that matched the aircraft's course and speed for a time before accelerating away and disappearing. The aircraft's crew were reported to have photographed the object, which they said had "hovered noiselessly" near the aircraft, before moving off. According to the documents, details of the coverup emerged when a man wrote to the government in 1999 seeking to find out more about the incident and described how his grandfather, who had served with the RAF in the war, was present when Churchill and U.S. General Dwight D. Eisenhower discussed how to deal with the UFO encounter. The files come from more than 5,000 pages of UFO reports, letters and drawings from members of the public, as well as questions raised in Parliament. They are available to download from The National Archives website. In the April 1957 West Freugh incident in Scotland, named after the principal military base involved, two unidentified objects flying high over the UK were tracked by radar operators. The objects were reported to operate at speeds and perform maneuvers beyond the capability of any known craft. Also significant is their alleged size, which – based on the radar returns – was closer to that of a ship than an aircraft. In the Rendlesham Forest incident of December 1980, U.S. military personnel witnessed UFOs near the air base at Woodbridge, Suffolk, over a period of three nights. On one night the deputy base commander, Colonel Charles I. Halt, and other personnel followed one or more UFOs that were moving in and above the forest for several hours. Col. Halt made an audio recording while this was happening and subsequently wrote an official memorandum summarizing the incident. After retirement from the military, he said that he had deliberately downplayed the event (officially termed 'Unexplained Lights') to avoid damaging his career. Other base personnel are said to have observed one of the UFOs, which had landed in the forest, and even gone up to and touched it. According to some Italian ufologists, the first documented case of a UFO sighting in Italy dates back to April 11, 1933, to Varese. Documents of the time show that an alleged UFO crashed or landed near Vergiate. Following this, Benito Mussolini created a secret group to look at it, called Cabinet RS/33. Alleged UFO sightings gradually increased since the war, peaking in 1978 and 2005. The total number of sightings since 1947 are 18,500, of which 90% are identifiable. In 2000, Italian ufologist Roberto Pinotti published material regarding the so-called "Fascist UFO Files", which dealt with a flying saucer that had crashed near Milan in 1933 (some 14 years before the Roswell, New Mexico, crash), and of the subsequent investigation by a never mentioned before Cabinet RS/33, that allegedly was authorized by Benito Mussolini, and headed by the Nobel scientist Guglielmo Marconi. A spaceship was allegedly stored in the hangars of the SIAI Marchetti in Vergiate near Milan. Julius Obsequens was a Roman writer who is believed to have lived in the middle of the fourth century AD. The only work associated with his name is the Liber de prodigiis (Book of Prodigies), completely extracted from an epitome, or abridgment, written by Livy; De prodigiis was constructed as an account of the wonders and portents that occurred in Rome between 249 BC-12 BC. An aspect of Obsequens' work that has inspired much interest in some circles is that references are made to things moving through the sky. These have been interpreted as reports of UFOs, but may just as well describe meteors, and, since Obsequens, probably, writes in the 4th century, that is, some 400 years after the events he describes, they hardly qualify as eye-witness accounts. In 1978, two young hikers, while walking on Monte Musinè near Turin, saw a bright light; one of them temporarily disappeared and, after a while, was found in a state of shock and with a noticeable scald on one leg. After regaining consciousness, he reported having seen an elongated vehicle and that some strangely shaped beings descended from it. Both the young hikers suffered from conjunctivitis for some time. The Uruguayan Air Force has conducted UFO investigations since 1989 and reportedly analyzed 2,100 cases of which they regard approximately 2% as lacking explanation. The USAF's Project Blue Book files indicate that approximately 1% of all unknown reports came from amateur and professional astronomers or other users of telescopes (such as missile trackers or surveyors). In 1952, astronomer J. Allen Hynek, then a consultant to Blue Book, conducted a small survey of 45 fellow professional astronomers. Five reported UFO sightings (about 11%). In the 1970s, astrophysicist Peter A. Sturrock conducted two large surveys of the AIAA and American Astronomical Society (AAS). About 5% of the members polled indicated that they had had UFO sightings. Astronomer Clyde Tombaugh, who admitted to six UFO sightings, including three green fireballs, supported the Extraterrestrial hypothesis for UFOs and stated he thought scientists who dismissed it without study were being "unscientific." Another astronomer was Lincoln LaPaz, who had headed the Air Force's investigation into the green fireballs and other UFO phenomena in New Mexico. LaPaz reported two personal sightings, one of a green fireball, the other of an anomalous disc-like object. (Both Tombaugh and LaPaz were part of Hynek's 1952 survey.) Hynek himself took two photos through the window of a commercial airliner of a disc-like object that seemed to pace his aircraft. In 1980, a survey of 1800 members of various amateur astronomer associations by Gert Helb and Hynek for CUFOS found that 24% responded "yes" to the question "Have you ever observed an object which resisted your most exhaustive efforts at identification?" MUFON reports that UFO sightings to their offices have increased by 67% in the previous three years as of 2011. According to MUFON international director Clifford Clift in 2011, "Over the past year, we've been averaging 500 sighting reports a month, compared to about 300 three years ago [67 percent],". According to the annual survey of reports conducted by Canadian-based UFO research group Ufology Research, reported UFO sightings doubled in Canada from 2011-2012. In 2013 the Peruvian government's Departamento de Investigación de Fenómenos Aéreos Anómalos (Anomalous Aerial Phenomena Research Department), or "DIFAA", was officially reactivated due to an increase in reported sightings. According to Colonel Julio Vucetich, head of the air force's aerospace interests division who himself claims to have seen an "anomalous aerial object", "On a personal basis, it's evident to me that we are not alone in this world or universe." In contrast, according to the UK-based Association for the Scientific Study of Anomalous Phenomena (ASSAP), reports of sightings in Britain to their office have declined by 96% since 1988. Light phenomena mirages, Fata Morgana, ball lightning, moon dogs, searchlights and other ground lights, etc. A 1952–1955 study by the Battelle Memorial Institute for the USAF included these categories as well as a "psychological" one. An individual 1979 study by CUFOS researcher Allan Hendry found, as did other investigations, that only a small percentage of cases he investigated were hoaxes (<1 %) and that most sightings were actually honest misidentifications of prosaic phenomena. Hendry attributed most of these to inexperience or misperception. Since 2001 there have been calls for greater openness on the part of the government by various persons. In May 2001, a press conference was held at the National Press Club in Washington, D.C., by an organization called the Disclosure Project, featuring twenty persons including retired Air Force and FAA personnel, intelligence officers and an air traffic controller. They all gave a brief account of what they knew or had witnessed, and stated that they would be willing to testify to what they had said under oath to a Congressional committee. According to a 2002 report in the Oregon Daily Emerald, Disclosure Project founder Steven M. Greer has gathered 120 hours of testimony from various government officials on the topic of UFO's, including astronaut Gordon Cooper and a Brigadier General. In 2007, former Arizona governor Fife Symington came forward and admitted that he had seen "a massive, delta-shaped craft silently navigate over Squaw Peak, a mountain range in Phoenix, Arizona" in 1997. On September 27, 2010, a group of six former USAF officers and one former enlisted Air Force man held a press conference at the National Press Club in Washington, D.C., on the theme "U.S. Nuclear Weapons Have Been Compromised by Unidentified Aerial Objects." They told how they had witnessed UFOs hovering near missile sites and even disarming the missiles. From April 29 to May 3, 2013, the Paradigm Research Group held the "Citizen Hearing on Disclosure" at the National Press Club. The group paid former U.S. Senator Mike Gravel and former Representatives Carolyn Cheeks Kilpatrick, Roscoe Bartlett, Merrill Cook, Darlene Hooley, and Lynn Woolsey $20,000 each to hear testimony from a panel of researchers which included witnesses from military, agency, and political backgrounds. Apollo 14 astronaut Dr Edgar Mitchell claimed that he knew of senior government employees who had been involved in “close encounters” and because of this he has no doubt that aliens have visited Earth. Besides anecdotal visual sightings, reports sometimes include claims of other kinds of evidence, including cases studied by the military and various government agencies of different countries (such as Project Blue Book, the Condon Committee, the French GEPAN/SEPRA, and Uruguay's current Air Force study). A comprehensive scientific review of cases where physical evidence was available was carried out by the 1998 Sturrock panel, with specific examples of many of the categories listed below. Radar contact and tracking, sometimes from multiple sites. These have included military personnel and control tower operators, simultaneous visual sightings, and aircraft intercepts. One such example were the mass sightings of large, silent, low-flying black triangles in 1989 and 1990 over Belgium, tracked by NATO radar and jet interceptors, and investigated by Belgium's military (included photographic evidence). Another famous case from 1986 was the Japan Air Lines flight 1628 incident over Alaska investigated by the Federal Aviation Administration (FAA). Photographic evidence, including still photos, movie film, and video. Claims of physical trace of landing UFOs, including ground impressions, burned or desiccated soil, burned and broken foliage, magnetic anomalies, increased radiation levels, and metallic traces. (See, e. g. Height 611 UFO incident or the 1964 Lonnie Zamora's Socorro, New Mexico encounter of the USAF Project Blue Book cases.) A well-known example from December 1980 was the USAF Rendlesham Forest incident in England. Another occurred in January 1981 in Trans-en-Provence and was investigated by GEPAN, then France's official government UFO-investigation agency. Project Blue Book head Edward J. Ruppelt described a classic 1952 CE2 case involving a patch of charred grass roots. Physiological effects on people and animals including temporary paralysis, skin burns and rashes, corneal burns, and symptoms superficially resembling radiation poisoning, such as the Cash-Landrum incident in 1980. Animal/cattle mutilation cases, that some feel are also part of the UFO phenomenon. Electromagnetic interference (EM) effects. A famous 1976 military case over Tehran, recorded in CIA and DIA classified documents, was associated with communication losses in multiple aircraft and weapons system failure in an F-4 Phantom II jet interceptor as it was about to fire a missile on one of the UFOs. Apparent remote radiation detection, some noted in FBI and CIA documents occurring over government nuclear installations at Los Alamos National Laboratory and Oak Ridge National Laboratory in 1950, also reported by Project Blue Book director Edward J. Ruppelt in his book. Claimed artifacts of UFOs themselves, such as 1957, Ubatuba, Brazil, magnesium fragments analyzed by the Brazilian government and in the Condon Report and by others. The 1964 Lonnie Zamora incident also left metal traces, analyzed by NASA. A more recent example involves a tear drop-shaped object recovered by Bob White and was featured in a television episode of UFO Hunters. Angel hair and angel grass, possibly explained in some cases as nests from ballooning spiders or chaff. Ufology is a neologism describing the collective efforts of those who study UFO reports and associated evidence. Saucer, toy-top, or disk-shaped "craft" without visible or audible propulsion. Large triangular "craft" or triangular light pattern, usually reported at night. Other: chevrons, (equilateral) triangles, crescent, boomerangs, spheres (usually reported to be shining, glowing at night), domes, diamonds, shapeless black masses, eggs, pyramids and cylinders, classic "lights." Popular UFO classification systems include the Hynek system, created by J. Allen Hynek, and the Vallée system, created by Jacques Vallée. Hynek's system involves dividing the sighted object by appearance, subdivided further into the type of "close encounter" (a term from which the film director Steven Spielberg derived the title of his 1977 UFO movie, Close Encounters of the Third Kind). Jacques Vallée's system classifies UFOs into five broad types, each with from three to five subtypes that vary according to type. A scientifically skeptical group that has for many years offered critical analysis of UFO claims is the Committee for Skeptical Inquiry (CSI). One example is the response to local beliefs that "extraterrestrial beings" in UFOs were responsible for crop circles appearing in Indonesia, which the government and the National Institute of Aeronautics and Space (LAPAN) described them as "man-made". Thomas Djamaluddin, research professor of astronomy and astrophysics at Lapan stated: "We have come to agree that this 'thing' cannot be scientifically proven. Scientists have put UFOs in the category of pseudoscience." UFOs are sometimes an element of conspiracy theories in which governments are allegedly intentionally "covering up" the existence of aliens by removing physical evidence of their presence, or even collaborating with extraterrestrial beings. There are many versions of this story; some are exclusive, while others overlap with various other conspiracy theories. In the U.S., an opinion poll conducted in 1997 suggested that 80% of Americans believed the U.S. government was withholding such information. Various notables have also expressed such views. Some examples are astronauts Gordon Cooper and Edgar Mitchell, Senator Barry Goldwater, Vice Admiral Roscoe H. Hillenkoetter (the first CIA director), Lord Hill-Norton (former British Chief of Defense Staff and NATO head), the 1999 French COMETA study by various French generals and aerospace experts, and Yves Sillard (former director of CNES, new director of French UFO research organization GEIPAN). It has also been suggested by a few paranormal authors that all or most human technology and culture is based on extraterrestrial contact (see also ancient astronauts). The Ummo affair, a decades-long series of detailed letters and documents allegedly from extraterrestrials. The total length of the documents is at least 1,000 pages, and some estimate that further undiscovered documents may total nearly 4000 pages. A José Luis Jordan Pena came forward in the early 1990s claiming responsibility for the phenomenon, and most consider there to be little reason to challenge his claims. George Adamski over the space of two decades made various claims about his meetings with telepathic aliens from nearby planets. He claimed that photographs of the far side of the Moon taken by the Soviet lunar probe Luna 3 in 1959 were fake, and that there were cities, trees and snow-capped mountains on the far side of the Moon. Among copycats was a shadowy British figure named Cedric Allingham. Ed Walters, a building contractor, in 1987 allegedly perpetrated a hoax in Gulf Breeze, Florida. 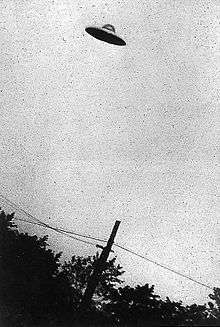 Walters claimed at first having seen a small UFO flying near his home and took some photographs of the craft. Walters reported and documented a series of UFO sightings over a period of three weeks and took several photographs. These sightings became famous and were called Gulf Breeze UFO incident. Three years later, in 1990, after the Walters family had moved, the new residents discovered a model of a UFO poorly hidden in the attic that bore an undeniable resemblance to the craft in Walters' photographs. Most investigators like the forensic photo expert William G. Hyzer now consider the sightings to be a hoax. A UFO Monument at Tenjo, Colombia. UFOs constitute a widespread international cultural phenomenon of the last 60 years. Gallup Polls rank UFOs near the top of lists for subjects of widespread recognition. In 1973, a survey found that 95 percent of the public reported having heard of UFOs, whereas only 92 percent had heard of U.S. President Gerald Ford in a 1977 poll taken just nine months after he left the White House. A 1996 Gallup Poll reported that 71 percent of the United States population believed that the U.S. government was covering up information regarding UFOs. A 2002 Roper Poll for the Sci-Fi Channel found similar results, but with more people believing that UFOs are extraterrestrial craft. In that latest poll, 56 percent thought UFOs were real craft and 48 percent that aliens had visited the Earth. Again, about 70 percent felt the government was not sharing everything it knew about UFOs or extraterrestrial life. In the film Yellow Submarine, Ringo states that the yellow submarine that is following him "must be one of them unidentified flying cupcakes." Another effect of the flying saucer type of UFO sightings has been Earth-made flying saucer craft in space fiction, for example the United Planets Cruiser C57D in Forbidden Planet (1956), the Jupiter 2 in Lost in Space, and the saucer section of the USS Enterprise in Star Trek, and many others. UFOs and extraterrestrials have been featured in many movies. ↑ For example, the USAF's Project Blue Book concluded that less than 2 % of reported UFOs were "psychological" or hoaxes; Allan Hendry's study for CUFOS had less than 1 %. ↑ For example, current USAF general reporting procedures are in Air Force Instruction (AFI)10-206. Section 5.7.3 (p. 64) lists sightings of "unidentified flying objects" and "aircraft of unconventional design" as separate categories from potentially hostile but conventional, unidentified aircraft, missiles, surface vessels, or submarines. Additionally, "unidentified objects" detected by missile warning systems, creating a potential risk of nuclear war, are covered by Rule 5E (p.35). ↑ Many of these documents are now online at the FOIA websites of these agencies such as the FBI FOIA site at the Wayback Machine (archived May 24, 2008), as well as private websites such as The Black Vault, which has an archive of several thousand U.S. government UFO-related documents from the USAF, Army, CIA, DIA, DOD, and NSA. ↑ The so-called Twining memo of Sept. 23, 1947, by future USAF Chief of Staff, General Nathan Twining, specifically recommended intelligence cooperation with the Army, Navy, Atomic Energy Commission, the Defense Department's Joint Research and Development Board, Air Force Scientific Advisory Board, National Advisory Committee for Aeronautics (NACA), Project RAND, and the Nuclear Energy for the Propulsion of Aircraft (NEPA) project. ↑ See, e.g., the 1976 Tehran UFO incident where a Defense Intelligence Agency report on the event had a distribution list that included the White House, Secretary of State, Joint Chiefs of Staff, National Security Agency (NSA), and Central Intelligence Agency (CIA). Several thousand UFO-related pages of more recent vintage from the CIA, NSA, DIA, and other agencies have also been released and can be viewed online. ↑ Ruppelt 1956, Chapter 1: "Project Blue Book and the UFO Story"
↑ "UFO Part 1 of 16". The Vault. Washington, D.C.: Federal Bureau of Investigation. pp. 1–20. Retrieved 2013-05-16. ↑ Aldrich, Lynn C. (July 14, 1947). "Unidentifiable objects, Williams Field; Chandler, Arizona" (Memorandum). Project Blue Book Archive. NARA-PBB1-922. Retrieved 2013-05-16. 1 2 3 Contreras, Russell (March 29, 2013). "FBI 'flying saucers' NM memo bureau's most viewed". Associated Press. Retrieved 2013-04-01. ↑ Roe, Ted. "On The Radar". NARCAP.org. National Aviation Reporting Center on Anomalous Phenomena (NARCAP). Archived from the original on 2011-07-27. Retrieved 2013-09-06. See May 17, 2013, NARCAP.org news release: "'Aliens', 'Alien Spaceships' & Government Coverups" on Facebook. 1 2 Cross, Anne (March 2004). "The Flexibility of Scientific Rhetoric: A Case Study of UFO Researchers". Qualitative Sociology. Springer. 27 (1): 3–34. doi:10.1023/B:QUAS.0000015542.28438.41. ISSN 0162-0436. 1 2 McDonald, James E. (July 29, 1968). "Statement on Unidentified Flying Objects: Submitted to the House Committee on Science and Astronautics at July 29, 1968, Symposium on Unidentified Flying Objects, Rayburn Bldg., Washington, D.C., by James E. McDonald" (PDF). Retrieved 2013-09-06. 1 2 3 "COMETA Report". Seattle, WA: ufoevidence.org. Retrieved 2013-07-13. ↑ Salisbury, David F. (July 1, 1998). "UFO study causes media sensation: 7/1/98". Stanford Report. Stanford, CA: Stanford University. Retrieved 2013-05-16. ↑ Hough, Andrew (April 13, 2010). "UFO studies should be 'legitimate university subject', claims American professor". The Daily Telegraph. London: Telegraph Media Group. Retrieved 2013-07-13. ↑ "Mutual UFO Network". MUFON.com. Cincinnati, OH: Mutual UFO Network, Inc. Retrieved 2013-07-13. ↑ "Center for UFO Studies". CUFOS.org. Chicago: Center for UFO Studies. Retrieved 2013-07-13. ↑ Speigel, Lee (August 26, 2011). "UFO Sightings Increase 67 Percent In 3 Years, History Channel Investigates Unexplained Aerial Phenomena". The Huffington Post. AOL. Retrieved 2013-07-13. ↑ Giordano, Daniela (November 13, 2006). "Do UFOs Exist in the History of Arts?". American Chronicle. Ultio, LLC. Archived from the original on 2012-08-19. Retrieved 2013-09-06. ↑ Cuoghi, Diego (2004). "The Art of Imagining UFOs". Skeptic. The Skeptics Society. 11 (1). Retrieved 2013-09-06. ↑ Booth, B J (December 8, 2008). "Before the Wright Brothers ... There Were UFOs". American Chronicle. Ultio, LLC. Archived from the original on 2012-08-19. Retrieved 2013-09-06. ↑ "Navy Officer Sees Meteors: They Were Red Ones, the Largest About Six Suns Big" (PDF). The New York Times. March 9, 1904. Retrieved 2013-09-06. ↑ "Saw Big Meteors: The Largest Had an Apparent Area of About Six Suns". Richland Shield and Banner. Mansfield, OH. March 10, 1904. p. 1. Retrieved 2013-09-06. ↑ Roerich, Nicholas (2001) [Originally published 1929; New York: Frederick A. Stokes Company]. Altai-Himalaya: A Travel Diary. Kempton, IL: Adventures Unlimited Press. pp. 361–362. ISBN 0-932-81393-3. LCCN 29011922. OCLC 50196530. ↑ Roerich, Nicholas (1990) [Originally published 1930; New York: Frederick A. Stokes Company]. Shambhala: In Search of the New Era. Frontispiece in colors by Svetoslav Roerich. Rochester, VT: Inner Traditions International, Ltd. pp. 6–7, 244. ISBN 0-89281-305-9. LCCN 30009209. OCLC 21332745. ↑ "Foo-Fighter". Time. January 15, 1945. Retrieved 2013-05-16. ↑ "Project Blue Book Special Report #14". Internet Archive. United States Air Force. Retrieved 2013-09-07. ↑ "Introductory Space Science". CUFON.org. West Jacksonville, FL: Computer UFO Network (CUFON). Retrieved 2013-05-16. Air Force Academy UFO material. 1 2 "AFD-070703-004.pdf" (PDF). Air Force Freedom of Information Act. United States Air Force. Retrieved 2013-09-07. ↑ Sagan, Carl (1995). The Demon-Haunted World: Science as a Candle in the Dark (1st ed.). New York: Random House. ISBN 0-394-53512-X. LCCN 95034076. OCLC 779687822. 1 2 3 Larson, Phil (November 5, 2011). "Searching for ET, But No Evidence Yet". White House. Retrieved 2013-09-06. 1 2 3 Atkinson, Nancy (November 5, 2011). "No Alien Visits or UFO Coverups, White House Says". Universe Today. Courtenay, B.C. Retrieved 2011-11-06. ↑ "Federal Bureau of Investigation FOIA Documents - Unidentified Flying Objects". Project Gutenberg. Retrieved 2013-09-07. Internal FBI memo from E. G. Fitch to D. M. Ladd concerning a request by General George F. Schulgen, Chief of the Requirements Intelligence Branch of Army Air Corps Intelligence, for the FBI to help with their investigation of UFO reports. ↑ Ruppelt 1956, Chapter 3: "The Classics"
↑ Haines, Gerald K. (1997). "CIA's Role in the Study of UFOs, 1947-90". Central Intelligence Agency. OCLC 713270503. Retrieved 2013-07-13. ↑ McDonald, James E. (1974) [Originally published 1972]. "Science in Default: Twenty-Two Years of Inadequate UFO Investigations". In Sagan, Carl; Page, Thornton. UFO's: A Scientific Debate. American Association for the Advancement of Science, 134th Meeting (Reprint ed.). New York: W. W. Norton & Company. ISBN 978-0-393-00739-8. LCCN 72004572. OCLC 934695. Retrieved March 30, 2011. ↑ "Canada's UFOs: The Search for the Unknown" (Virtual museum). Ottawa: Library and Archives Canada. Retrieved 2013-09-08. 1 2 "GEIPAN: Le GEIPAN". Groupe d'Études et d'Informations sur les Phénomènes Aérospatiaux Non Identifiés (GEIPAN). Paris: Centre national d'études spatiales (CNES). Retrieved 2013-05-16. ↑ "A history of UAP research at CNES". CNES. Retrieved October 6, 2014. ↑ "English translation of GEIPAN FAQ". Retrieved October 6, 2014. ↑ "Official French Gov't UFO study project to resume with new director". Seattle, WA: ufoevidence.org. October 2005. Retrieved 2013-07-13. ↑ "'Yes, UFOs exist': Position statement by SEPRA head, Jean-Jacques Velasco". Seattle, WA: ufoevidence.org. April 18, 2004 [Originally published in La Dépêche du Midi]. Retrieved 2013-07-13. ↑ "Assessment of the UFO phenomenon by GEPAN (1978)". Seattle, WA: ufoevidence.org. Retrieved 2013-07-13. ↑ "Ovni-nouvelle-commission-denquete-3AF-PAN (Partie 1)". Dailymotion. Paris: Orange. Retrieved 2014-01-11. ↑ "Rapport d'étape de la Commission Sigma/3AF" (PDF). Paris: Association Aéronautique et Astronautique de France. May 31, 2010. Retrieved 2014-01-11. ↑ Dini, Luc (January 10, 2013). "Sigma 2". 3AF. Paris: Association Aéronautique et Astronautique de France. Retrieved 2014-01-11. ↑ Boudier, Alain (June 20, 2013). "Alexandre – Alain Boudier – Sygma & 3AF". RimLive.com (Interview). Interview with Alexandre. Paris. Retrieved 2014-01-11. ↑ "Unidentified Flying Objects" (PDF). The Black Vault. Northridge, CA: John Greenewald. June 1951. DSI/JTIC Report No. 7. Retrieved 2013-09-16. 1 2 "UFO files". Kew: The National Archives. Retrieved 2013-09-10. ↑ "Files released on UFO sightings". BBC News. London: BBC. May 14, 2008. Retrieved 2013-05-16. ↑ "The truth is out there: Britons 'spotted' UFOs, records say". London. AFP. May 13, 2008. Retrieved 2013-05-16. ↑ "Airliner had near miss with UFO". BBC News. London: BBC. October 20, 2008. Retrieved 2013-05-16. ↑ Defence Intelligence Staff (December 2000). "Unidentified Aerial Phenomena in the UK Air Defence Region" (PDF). Kew: The National Archives. p. 2. 55/2/00. Retrieved 2013-09-10. See also The National Archives site: "Unidentified Aerial Phenomena (UAP) in the UK Air Defence Region" for archived documents. ↑ Dearing, Stephanie (December 5, 2009). "Cost-cutting causes British gov't to shut down UFO investigations". Digital Journal. Toronto. Retrieved 2013-05-16. ↑ "Churchill 'banned UFO report to avoid mass panic'". London. AFP. August 5, 2010. Retrieved 2013-05-16. ↑ "Churchill Ordered UFO Coverup, Documents Suggest". FoxNews.com. New York: Fox Entertainment Group. August 5, 2010. Retrieved 2013-07-13. ↑ "Churchill ordered UFO cover-up, National Archives show". BBC News. London: BBC. August 5, 2010. Retrieved 2013-07-13. ↑ Lissoni, Alfredo (Autumn 2001). "New Documents 'Will Revolutionize UFOlogy'!". Flying Saucer Review. London: Flying Saucer Service. 46/3: 13–17. ISSN 0015-4881. Retrieved 2013-09-09. ↑ "And Ufology UFO Italy UFO sightings, not Flying Saucers, Aliens or Extraterrestrials". Ufo.it. Retrieved October 6, 2014. ↑ Pirro, Deirdre (June 17, 2010). "Unexpected fans". The Florentine (125/2010). Florence: The Florentine Group. Retrieved 2013-07-13. ↑ Innocenti, Stefano. "Gli UFO nel Lazio". UFO.it (in Italian). Cermenate: Maurizio Verga. Retrieved 2013-07-13. ↑ Fiorino, Paolo. "Caselle, 1973". UFO.it (in Italian). Cermenate: Maurizio Verga. Retrieved 2013-05-16. ↑ Nattero, Rosalba (2011-06-14). "Il Monte Musiné tra storia, tradizione, UFO e viaggi nel tempo". Shan Newspaper. Retrieved 2014-02-03. ↑ Isgleas, Daniel (June 7, 2009). "Hay aún 40 casos de ovnis sin explicación". El País (in Spanish). Montevideo: Teledoce. Retrieved 2013-09-10. ↑ Sparks, Brad, ed. (October 2, 2009). "Comprehensive Catalog of 1,600 Project BLUE BOOK UFO Unknowns". CUFOS.org. Chicago: Center for UFO Studies. Retrieved 2013-07-13. ↑ Herb, Gert; Hynek, J. Allen (May 2006). "The Amateur Astronomer and the UFO Phenomena". International UFO Reporter. Reprint. Chicago: J. Allen Hynek Center for UFO Studies. 30 (3): 14–16. ↑ Copping, Jasper (November 4, 2012). "UFO enthusiasts admit the truth may not be out there after all". The Daily Telegraph. London: Telegraph Media Group. Retrieved 2013-11-21. ↑ Duin, Julia (May 11, 2001). "Government is covering up UFO evidence, group says". The Washington Times. Washington, D.C.: News World Communications. Retrieved 2013-09-11. ↑ Spavin, Vicky (May 9, 2001). "They're Here; UFO Watchers to Reveal Proof That Aliens Have Visited Earth". The Daily Record. Glasgow: Trinity Mirror. Retrieved 2013-03-10. ↑ Raymer, Katelynn; Ruppe, David (May 10, 2001). "Group Calls for Disclosure of UFO Info". ABC News. Retrieved 2013-03-11. ↑ Watson, Rob (May 10, 2001). "UFO spotters slam 'US cover-up'". BBC News. London: BBC. Retrieved 2013-09-11. ↑ Kehnemui, Sharon (May 10, 2001). "Men in Suits See Aliens as Part of Solution, Not Problem". FoxNews.com. New York: Fox Entertainment Group. Retrieved 2007-05-10. ↑ McCullagh, Declan (May 10, 2001). "Ooo-WEE-ooo Fans Come to D.C.". Wired News. Waltham, MA: Lycos. Retrieved 2007-05-10. ↑ Schmidt, Brad (April 25, 2002). "Alien theorist offers proof of government coverup". Oregon Daily Emerald. Eugene, OR. Retrieved 2012-12-12. ↑ Symington, Fife (November 9, 2007). "Symington: I saw a UFO in the Arizona sky". CNN. Atlanta, GA: Turner Broadcasting System. Retrieved 2013-11-25. ↑ Schultz, Marisa (April 29, 2013). "Ex-Rep. Kilpatrick 'waiting to hear' evidence of space aliens". The Detroit News. MediaNews Group. Archived from the original on 2013-05-31. Retrieved 2013-09-11. ↑ "Citizen Hearing on Disclosure". Citizen Hearing on Disclosure. Bethesda, MD: Paradigm Research Group. Retrieved 2013-09-11. ↑ "Physical Evidence Related to UFO Reports - Sturrock Panel - Abstract, Summary and Introduction". Seattle, WA: ufoevidence.org. Retrieved 2013-09-08. ↑ "Sturrock Panel". Seattle, WA: ufoevidence.org. Retrieved 2013-09-08. Other links to Sturrock panel. ↑ Van Utrecht, Wim. "Triangles over Belgium". Caelestia. Caelestia.be. Retrieved 2013-07-13. ↑ "UFO Relics". UFO Hunters. Season 3. Episode 33. May 6, 2009. History. ↑ Krismantari, Ika (February 6, 2011). "Crop circles provide food for thought". The Star. Petaling Jaya: Star Publications. Retrieved 2013-09-12. ↑ "Is the Government Hiding Facts On UFOs & Extraterrestrial Life? ; New Roper Poll Reveals that More Than Two-Thirds of Americans Think So" (Press release). New York: Business Wire. October 15, 2002. Retrieved 2013-09-12. ↑ "Poll: U.S. hiding knowledge of aliens". CNN. Atlanta, GA: Turner Broadcasting System. June 15, 1997. Retrieved 2013-09-12. ↑ Corrales, Scott (2001). "People Are Strange: Unusual UFO Cults Examined". Paranoia. San Diego, CA. Archived from the original on 2003-02-08. ↑ Posner, Gary P. (July 1992). "The Gulf Breeze 'UFOs'". Tampa Bay Sounding. Seminole, FL: Tampa Bay Mensa. Retrieved 2013-07-13. ↑ "The Roper Poll". Ufology Resource Center. SciFi.com. September 2002. Archived from the original on 2006-07-13. Retrieved 2006-08-19. ↑ "UFO Fast Facts". MUFON.com. Cincinnati, OH: Mutual UFO Network, Inc. Archived from the original on 2008-04-30. Retrieved 2013-07-13. Bullard, Thomas; (2012). The Myth and Mystery of UFOs. Lawrence: University of Kansas. ISBN 978-0-7006-1729-6. Clark, Jerome (1998). The UFO Book: Encyclopedia of the Extraterrestrial. Detroit, MI: Visible Ink Press. ISBN 1-57859-029-9. LCCN 97035767. OCLC 37370629. Many classic cases and UFO history provided in great detail; highly documented. Curran, Douglas (2001) [1st edition originally published 1985; New York: Abbeville Press]. In Advance of the Landing: Folk Concepts of Outer Space. Foreword by Tom Wolfe (Revised ed.). New York: Abbeville Press. ISBN 0-7892-0708-7. LCCN 00052589. OCLC 45270419. Non-sensational but fair treatment of contemporary UFO legend and lore in N. America, including the so-called "contactee cults." The author traveled the United States with his camera and tape recorder and directly interviewed many individuals. Deardorff, J.; Haisch, B.; Maccabee, B.; Puthoff, H. E. (2005). "Inflation-Theory Implications for Extraterrestrial Visitation" (PDF). Journal of the British Interplanetary Society. London: British Interplanetary Society. 58: 43–50. Bibcode:2005JBIS...58...43D. ISSN 0007-084X. Retrieved 2013-09-13. Friedman, Stanton T. (2008). Flying Saucers and Science: A Scientist Investigates the Mysteries of UFOs. Franklin Lakes, NJ: New Page Books. ISBN 978-1-60163-011-7. LCCN 2008006291. OCLC 179812690. Greer, Steven M.; (2001). Disclosure. Crozer: Crossing Point. ISBN 0-9673238-1-9. Hall, Richard H., ed. (1997) [Originally published 1964; Washington, D.C.: National Investigations Committee On Aerial Phenomena (NICAP)]. The UFO Evidence (Reissue ed.). New York: Barnes & Noble Books. ISBN 0-7607-0627-1. LCCN 64006912. OCLC 39544334. Well-organized, exhaustive summary and analysis of 746 unexplained NICAP cases out of 5000 total cases—a classic. Hall, Richard H., ed. (2001). UFO Evidence: Volume II, A 30-year Report. Lanham, MD: Scarecrow Press. ISBN 0-8108-3881-8. LCCN 00055624. OCLC 44391782. Another exhaustive case study, more recent UFO reports. Hendry, Allan (1979). The UFO Handbook: A Guide to Investigating, Evaluating, and Reporting UFO Sightings. Foreword by J. Allen Hynek (1st ed.). Garden City, NY: Doubleday. ISBN 0-385-14348-6. LCCN 78008211. OCLC 4642190. Skeptical but balanced analysis of 1300 CUFOS UFO cases. Hynek, J. Allen (1972). The UFO Experience: A Scientific Inquiry. Chicago: Henry Regnery Company. LCCN 76183827. OCLC 341112. Hynek, J. Allen (1997) [Originally published 1977; New York: Dell Publishing Company]. The Hynek UFO Report. New foreword by Jacques Vallée. New York: Barnes & Noble Books. ISBN 0-7607-0429-5. OCLC 3601609. Analysis of 640 high-quality cases through 1969 by UFO legend Hynek. Jacobs, David M., ed. (2000). UFOs and Abductions: Challenging the Borders of Knowledge. Lawrence, KS: University Press of Kansas. ISBN 0-7006-1032-4. LCCN 00028970. OCLC 43615835. Keyhoe, Donald (1950). The Flying Saucers are Real. New York: Fawcett Publications. LCCN 50004886. OCLC 1674240. Retrieved 2013-09-06. Keyhoe, Donald E. (1953). Flying Saucers from Outer Space (1st ed.). New York: Henry Holt and Company. LCCN 53009588. OCLC 181368. Retrieved 2013-05-16. Latagliata, Rosamaria (2006). UFO: verità o menzogna?. Gli atlanti di Voyager (in Italian). Florence: Giunti Editore. ISBN 978-8-809-04698-6. OCLC 635701671. McCarthy, Paul E. (1975). Politicking and Paradigm Shifting: James E. McDonald and the UFO Case Study (Thesis/dissertation) (Internet ed.). Canterbury, CT: Sign Historical Group. OCLC 663722044. Retrieved 2013-07-13. Menzel, Donald H.; Taves, Ernest H. (1977). The UFO Enigma: The Definitive Explanation of the UFO Phenomenon. Introduction by Fred L. Whipple (1st ed.). Garden City, NY: Doubleday. ISBN 0-385-03596-9. LCCN 76016255. OCLC 2597609. Mitchell, Edgar; (2008). The Way of the Explorer. Franklin Lakes: Career Press. ISBN 978-1-56414-977-0. Rose, Bill; Buttler, Tony (2004). Flying Saucer Aircraft. Secret Projects. Hinckley, England: Midland Publishing. ISBN 978-1-857802-337. OCLC 99774524. Sagan, Carl; Page, Thornton, eds. (1996) [Originally published 1972]. UFO's: A Scientific Debate (Reprint ed.). New York: Barnes & Noble. ISBN 978-0-7607-0196-6. LCCN 72004572. OCLC 35840064. Scully, Frank (1950). Behind the Flying Saucers. New York: Henry Holt and Company. OCLC 1467735. Sheaffer, Robert (1981). The UFO Verdict: Examining the Evidence. Buffalo, NY: Prometheus Books. ISBN 0-879-75146-0. LCCN 80084406. OCLC 7364885. Sheaffer, Robert (1998). UFO Sightings: The Evidence. Amherst, NY: Prometheus Books. ISBN 1-57392-213-7. LCCN 98006410. OCLC 38738821. Revised edition of The UFO Verdict. Stanford, Ray (1976). Socorro 'Saucer' in a Pentagon Pantry (1st ed.). Austin, TX: Blueapple Books. ISBN 0-917-09200-7. LCCN 76013768. OCLC 2524239. Sturrock, Peter A.; Holzer, T. E.; Jahn, R.; et al. (1998). "Physical Evidence Related to UFO Reports: The Proceedings of a Workshop Held at the Pocantico Conference Center, Tarrytown, New York, September 29 - October 4, 1997" (PDF). Journal of Scientific Exploration. Stanford, CA: Society for Scientific Exploration. 12 (2): 179–229. ISSN 0892-3310. Retrieved 2013-09-08. Sturrock panel report on physical evidence. Sturrock, Peter A. (1999). The UFO Enigma: A New Review of the Physical Evidence. New York: Warner Books. ISBN 0-446-52565-0. LCCN 99066643. OCLC 42645835. Vallée, Jacques (2008) [Originally published 1991; New York: Ballantine Books]. Revelations: Alien Contact and Human Deception. San Antonio, TX: Anomalist Books. ISBN 978-1-933-66530-6. LCCN 91091858. OCLC 225866107. Viberti, Pier Giorgio (2010) [Originally published 1997]. Incontri ravvicinati: Avvistamenti e contatti da mondi lontani. Atlanti del sapere (in Italian). Florence: Giunti Editore. ISBN 978-8-809-75032-6. OCLC 800130536. Clarke, David (2009). The UFO Files: The Inside Story of Real-Life Sightings. Kew: The National Archives. ISBN 978-1-905615-50-6. OCLC 316039535. Reports from the UK government files. Dolan, Richard M. (2000). UFOs and the National Security State: An Unclassified History, Volume One: 1941–1973 (1st ed.). Rochester, NY: Keyhole Publishing Company. ISBN 0-967-79950-3. LCCN 00691087. OCLC 45546629. Dolan is a professional historian. Downes, Jonathan; Wright, Nigel (2005). The Rising of the Moon (Revised ed.). Bangor, Northern Ireland: Xiphos Books. ISBN 978-0-954-49365-3. OCLC 70335856. Fawcett, Lawrence; Greenwood, Barry J. (1992) [Originally published 1984 as Clear Intent; Englewood Cliffs, NJ: Prentice Hall]. The UFO Cover-up: What the Government Won't Say. Foreword by J. Allen Hynek (First Fireside ed.). New York: Simon & Schuster. ISBN 0-671-76555-8. LCCN 84009818. OCLC 28384401. Many UFO documents. Good, Timothy (1988). Above Top Secret: The Worldwide UFO Cover-Up. Foreword by Lord Hill-Norton (1st Quill ed.). New York: William Morrow and Company. ISBN 0-688-09202-0. LCCN 88208434. OCLC 707516815. Many UFO documents. Good, Timothy (1997) [Originally published 1996]. Beyond Top Secret: The Worldwide UFO Security Threat. Foreword by Lord Hill-Norton (Fully revised and updated ed.). London: Pan Books. ISBN 0-330-34928-7. OCLC 38490850. Hall, Michael D.; Connors, Wendy A. (1998). Alfred Loedding & the Great Flying Saucer Wave of 1947 (PDF). Albuquerque, NM: White Rose Press. OCLC 41104299. Retrieved 2013-09-07. Keel, John (1996) [Originally published 1970 as UFOs: Operation Trojan Horse; New York: G. P. Putnam's Sons]. Operation Trojan Horse (PDF). Lilburn, GA: IllumiNet Press. ISBN 978-0-9626534-6-9. LCCN 96014564. OCLC 34474485. Kocher, George (November 1968). UFOs: What to Do (PDF). RAND Corporation. DRU-1571. Retrieved 2013-09-07. UFO historical review, case studies, review of hypotheses, recommendations. Maccabee, Bruce (2000). UFO FBI Connection: The Secret History of the Government’s Cover-Up (1st ed.). St. Paul, MN: Llewellyn Publications. ISBN 1-56718-493-6. LCCN 00028277. OCLC 43634902. Randle, Kevin D. (1997). Project Blue Book Exposed (1st ed.). New York: Marlowe & Company. ISBN 1-56924-746-3. LCCN 97072378. OCLC 37047544. Ruppelt, Edward J. (1956). The Report on Unidentified Flying Objects (1st ed.). Garden City, NY: Doubleday & Company, Inc. LCCN 56005444. OCLC 1941793. A UFO classic by insider Ruppelt, the first head of the USAF Project Blue Book. Swords, Michael; Powell, Robert; et al. (2012). UFOs and Government: A Historical Inquiry. San Antonio, TX: Anomalist Books. ISBN 978-1-933-66558-0. OCLC 809977863. Weinstein, Dominique F. (February 2001). Unidentified Aerial Phenomena: Eighty Years of Pilot Sightings (PDF). Boulder Creek, CA: National Aviation Reporting Center on Anomalous Phenomena (NARCAP). NARCAP TR-04. Retrieved 2013-09-06. Haines, Richard F., ed. (1979). UFO Phenomena and the Behavioral Scientist. Metuchen, NJ: Scarecrow Press. ISBN 0810812282. LCCN 79014878. OCLC 5008381. Jung, C G (1978) [Originally published 1958 as Ein moderner Mythus: von Dingen, die am Himmel gesehen werden]. Flying Saucers: A Modern Myth of Things Seen in the Skies. Translation by R.F.C. Hull. Princeton, NJ: Princeton University Press. ISBN 0-691-01822-7. LCCN 78004325. OCLC 4762238. Simón, Armando (February 1976). "UFOs: Testing for the existence of Air Force censorship". Psychology: A Journal of Human Behavior. 13 (1): 3–5. ISSN 0033-3077. Simón, Armando (1981). "A Nonreactive, Quantitative Study of Mass Behavior with Emphasis on the Cinema as Behavior Catalyst". Psychological Reports. Ammons Scientific. 48 (3): 775–785. doi:10.2466/pr0.1981.48.3.775. ISSN 0033-2941. Simón, Armando (1984). "Psychology and UFOs". Skeptical Inquirer. Amherst, NY: Committee for Skeptical Inquiry. 8: 355–367. Ford, L. H.; Roman, Thomas A. (1996). "Quantum field theory constrains traversable wormhole geometries". Physical Review D. 53 (10): 5496–5507. arXiv:gr-qc/9510071 . Bibcode:1996PhRvD..53.5496F. doi:10.1103/PhysRevD.53.5496. Hill, Paul R. (1995). Unconventional Flying Objects: A Scientific Analysis. Charlottesville, VA: Hampton Roads Publishing Company. ISBN 1-57174-027-9. LCCN 97109204. OCLC 34075199. Analysis of UFO technology by pioneering NACA/NASA aerospace engineer. Krasnikov, S. (2003). "The quantum inequalities do not forbid spacetime shortcuts". Physical Review D. 67 (10): 104013. arXiv:gr-qc/0207057 . Bibcode:2003PhRvD..67j4013K. doi:10.1103/PhysRevD.67.104013. McCampbell, James M. (1976). Ufology: A Major Breakthrough in the Scientific Understanding of Unidentified Flying Objects. Millbrae, CA: Celestial Arts. ISBN 0-89087-144-2. LCCN 76150644. OCLC 2655734. Retrieved 2013-09-13. McCampbell, James M. (1987). "Effects of UFOs Upon People" (PDF). In Evans, Hilary; Spencer, John. UFOs, 1947-1987: The 40-year Search for an Explanation (PDF)|format= requires |url= (help). London: Fortean Tomes. ISBN 1-870-02102-9. LCCN 88112852. OCLC 18560737. Retrieved 2013-09-13. Rullán, Antonio F. (July 2, 2000). "Odors from UFOs: Deducing Odorant Chemistry and Causation from Available Data" (PDF) (Preliminary paper). Retrieved 2013-09-13. Sarfatti, Jack (2006). Super Cosmos: Through Struggles to the Stars. Indianapolis, IN: AuthorHouse. ISBN 978-1-418-47662-5. LCCN 2004095148. OCLC 70962499. Stevens, Henry (2003). Hitler's Flying Saucers: A Guide to German Flying Discs of the Second World War. Kempton, IL: Adventures Unlimited Press. ISBN 1-931882-13-4. LCCN 2003271002. OCLC 51731940. Plait, Philip C. (2002). "Misidentified Flying Objects: UFOs and Illusions of the Mind and Eye". Bad Astronomy: Misconceptions and Misuses Revealed, from Astrology to the Moon Landing "Hoax". Illustrations by Tina Cash Walsh. New York: John Wiley & Sons, Inc. ISBN 0-471-40976-6. LCCN 2002277382. OCLC 48885221. Ridpath, Ian. "Astronomical Causes of UFOs". Ian Ridpath. Retrieved 2013-07-13. Sheaffer, Robert (2012) [Originally published 2011]. Psychic Vibrations: Skeptical Giggles from the Skeptical Inquirer (2nd ed.). Charleston, SC: CreateSpace. ISBN 978-1-463-60157-7. Retrieved 2013-07-13. "UFOs: Fact or Fiction?" Declassified CIA documents from the 1940s through the early 1990s.